The Bluesk y Healthcare Wallglider or spacesaver is the perfect chair for small rooms or room layouts where the lounge sits close to the wall. As it goes through it's recline action, the chair pivots and moves forwards away from the wall. This allows you to leave minimal space between the chair and the wall, a minimum of 15cm of clearance is required between the wall and the chair, when in an upright position. 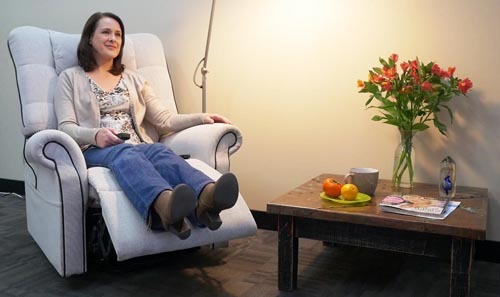 Unlike other one-motor lift and recline chairs, the recline action has been split into two distinct movements, where the leg rest can raise and lower without the backrest moving, allowing you to elevate your feet whilst sitting upright. 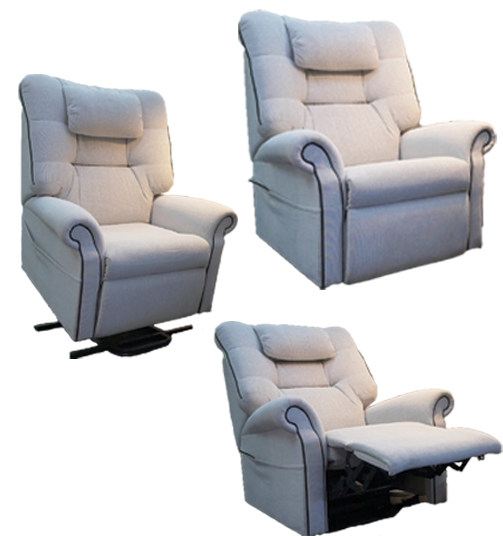 The backrest can only recline once the legs have been fully elevated. 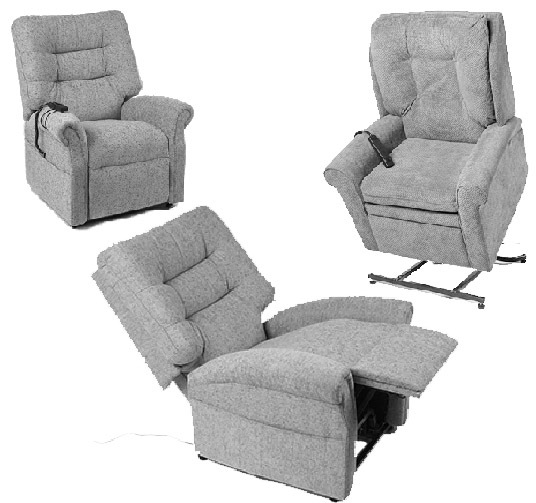 Wallglider chairs allow a variety of seating positions, from sitting upright to watch television, to a 45-degree recline for an afternoon nap. It's space saving mechanism sees it fit well into the layout of any lounge room. 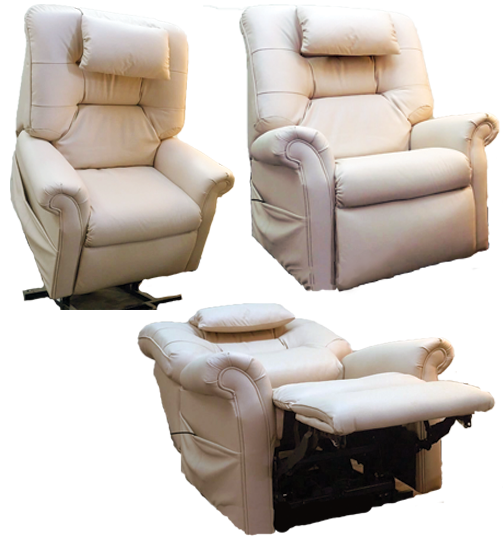 The Wallglider is available in three frame sizes of Small, Medium or Large and we offer a choice of different materials including leather options. The Image on the right with the woman in the Chair shows a custom-made chair in a grey fabric with black piping on the edges. You can also choose from two different styles of backs. 1. 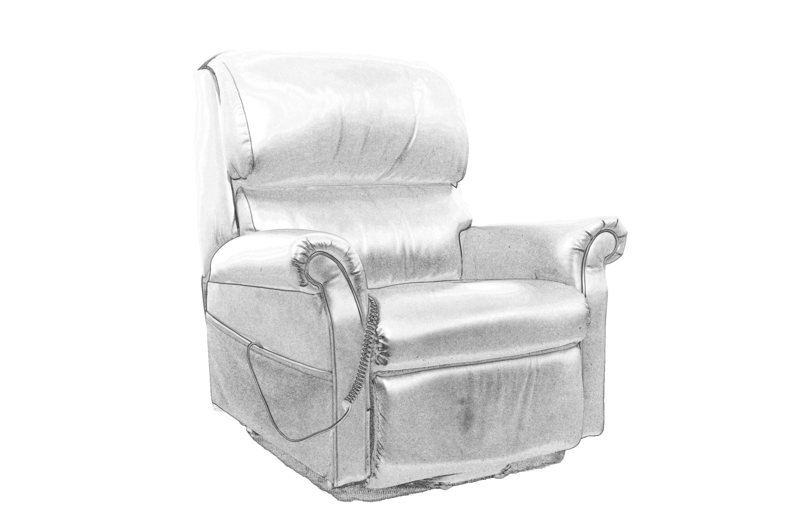 The Two-Roll Comfort back offers an easy adjustable back by simply adding or removing some stuffing from the back cushions behind the zip. 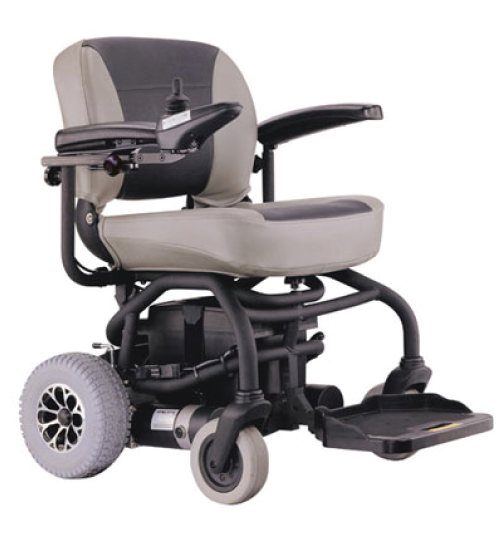 The Comfort Two Roll Back also offers more lumbar support. 2. The Classic Back is our most popular model, it offers strong shoulder and neck support. The chair comes with a complimentary head pillow, which can be easiliy removed or adjusted in height. It is also possible to easily adjust the stuffing of the pillow thanks to the handy zip. We also specialize in WA-made fully custom build Chairs. These chairs will be made to your measurements and requirements. Our friendly consultant will measure you and ensure that the chair is build accordingly. Having a custom-made chair gives your you complete control of the look and design of your chair. You can choose materials that blend into your existing decor or design a chair to stand out and be as individual as you are. 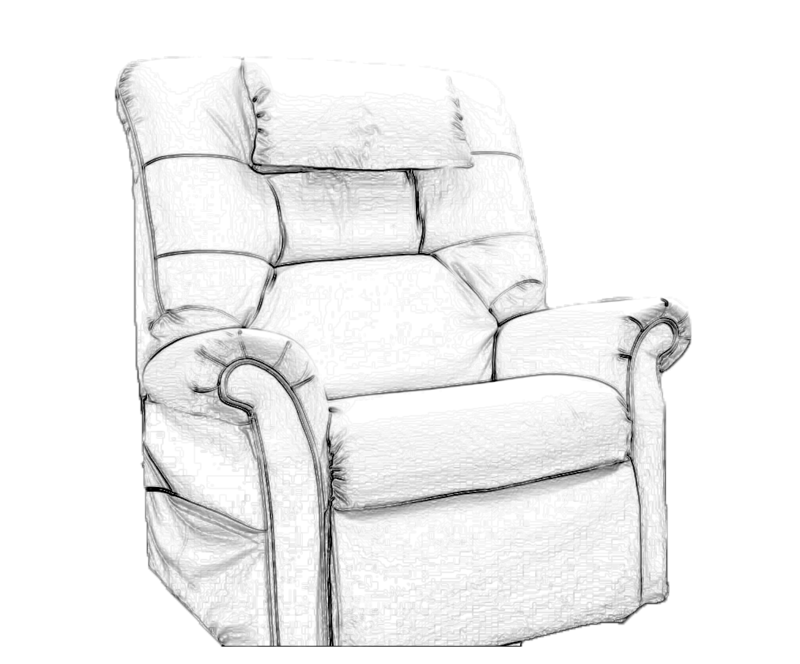 These custom made chairs are Western Australian made using high-quality materials and come with a 5-year warranty. The Below Table shows the available sizes for both custom-build lifting chairs and stocked chairs. The blue numbers show the range of possible dimensions when choosing a custom build chair, whilst using a standard sized frame. You can also choose a custom build frame, which will allow you to choose dimensions outside of the below table. The orange numbers in the brackets show the sizes of the stocked items. The only modification that can be made to these is to add wheels, hence increase the height of the chair. The below Image shows the sequence of motion that the chair goes through, the below pictured chair is a Brown Leather Classic Back Wallglider (stocked item).